Vintimar offers custom Shipboard Monitoring and Control Systems tailored to each customers unique requirements. We specialize in integration of shipboard systems on new builds as well as in retrofitting existing systems. Our systems provide monitoring and control from easy-to-use graphical user interfaces (GUIs). These GUIs runs on LCD touchscreen displays as well as on smaller operator interface terminals. We use components that are rugged and can handle the marine environment to provide years of reliable service. Our screens incorporate extensive research in the avionics industry to bring you functional and easy to read graphic user interfaces. See the products page for more details on marine products. Vintimar also supports and troubleshoots monitoring, control and PLC based systems supplied by other vendors including companies that are no longer in business. 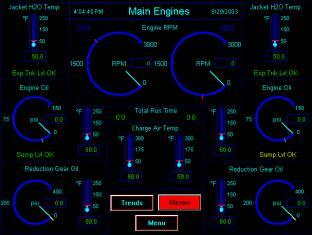 Monitor and control the operation of onboard systems. Obtain operational parame ters and control via standalone sensors or using proprietary manufacturer protocols (Catlink, DDEC). Easily modify alarm setpoints. Enable or disable alarms on an item by item basis. Log alarms and events with time and date stamps. Historically log and chart operational parameters. Tank level monitoring with the ability to easily switch between English and Metric units. Fuel consumption management including monitoring, logging of fuel flow and estimating future fuel needs. Bilge & ballast system monitoring and control. Alarming based on bilge levels and, if desired, automatic activation of appropriate bilge pumps. Track run hours for different equipment and specify maintenance task setpoints based on hours as well as gallons burnt for engines. NAVIGATION: Installation and support of Transas electronic charting software. DISPLAYS: We supply Hatteland and other computer displays suitable for bridge as well as sunlight readable applications. HVAC: Control & display of temperature and humidity, trending and setpoint deviation alarming. Pool and spa control. Ability to easily save and recall owner/crew setpoints. SHIPBOARD SECURITY / INTEGRITY: Interface with standalone security systems to provide intruder alarm mimics, zone arming/disarming capability and status indication using actual vessel layout. Show open/close status of doors and hatches as well as control doors with electric locks. CCTV: Camera control including pan, tilt, zoom and focus capabilities. Routing of the image to any location by means of modulated TV channels, video feed to dedicated displays or over network. FIRE & LIFE SAFETY: Provide alarm mimic capability and smart graphical and audio evacuation route information for the occupants based on the fire location. Interface with Person Overboard Systems. PAGING SYSTEMS: Interface with onboard paging system to automatically send alphanumeric pages in the event of fire or critical engine alarms. Send standard messages to crew via simple graphical screens. STEWARD CALL: System consists of pushbuttons in owner areas, which when pressed notifies crew members via displays in crew watch areas and by pagers. COMPUTER NETWORKING: Development and installation of wired and wireless networks. BRIDGE INTEGRATION: Flexible system for sharing limited number of displays between multiple video sources such as ECDIS, CCTV cameras and radar. MOTORIZED CURTAINS, BLINDS & AWNINGS: Control including ability to automatically open and close at specified times. Group curtains/blinds for control automation purposes. REMOTE ACCESS/NOTIFICATION: Event driven messaging to specified phone/pager numbers and email addresses. It is also possible to connect in from a remote location and perform monitoring/control tasks.